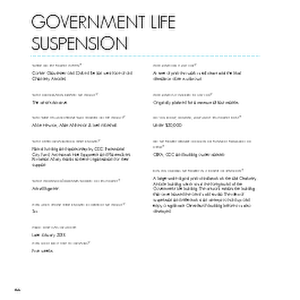 A photograph of Mike Hewson's installation, 'Government Life Suspension', on the wall of the Chancery Arcade building. 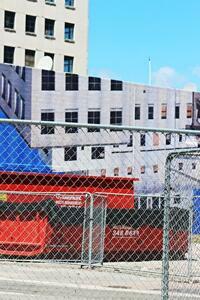 The artwork depicts a reflection of the Government Life building which is visible behind the Chancery Arcade. 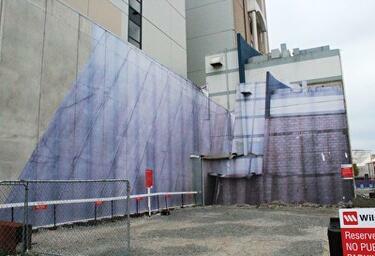 The installation is part of a series titled 'Homage to the Lost Spaces'. 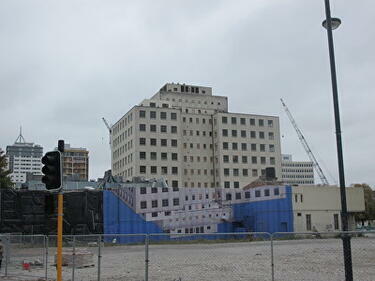 The Government Life and Chancery Arcade buildings were demolished in 2014. 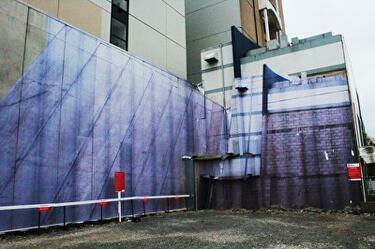 A photograph of Mike Hewson's installation, 'Old Public Toilets 2014'. 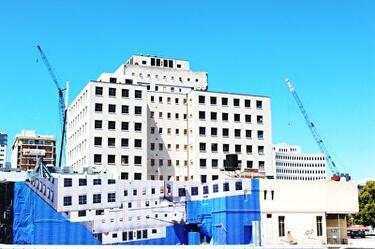 The artwork depicts a distorted image of the surrounding buildings. 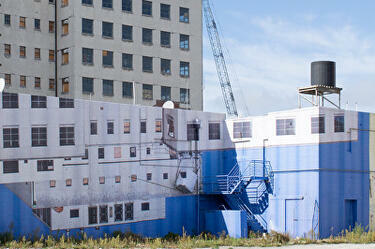 The installation is part of a series titled 'Homage to the Lost Spaces'. A photograph of Mike Hewson's installation, 'Prop Hide', on the south wall of the former Trinity Congregational Church. 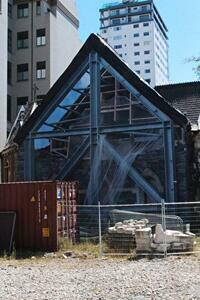 The installation is part of a series titled, 'Homage to the Lost Spaces'. The building housed the Octagon Live restaurant between 2006 and 2010. 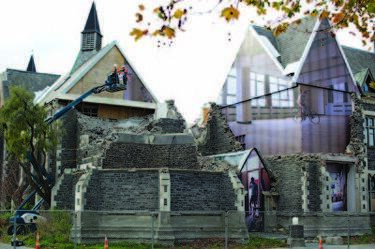 A video of interviews with four enterprising young Christchurch residents recorded two years after the 22 February 2011 earthquake. The video includes interviews with Gap Filler Director Coralie Winn, Arts Centre Director Andrew Lovatt, artist Mike Hewson, and Student Volunteer Army leader Jason Pembleton. 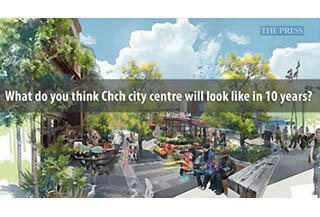 The interviewees are asked four questions: 'What do you think Christchurch city centre will look like in 10 years? ', 'What do you most want to see in the new city? ', 'What do you miss most about the old city? 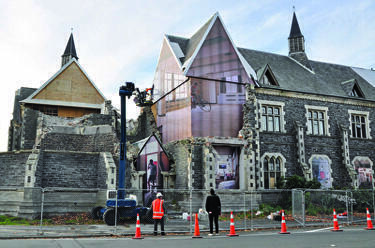 ', and 'What keeps you in Christchurch?'. 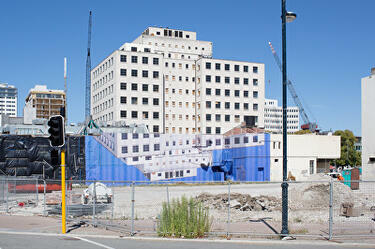 A photograph of Mike Hewson's artwork, 'Government Life Suspension', on the side of the former Chancery Arcade. 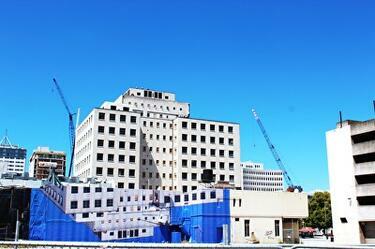 The photograph is taken from an angle such that the artwork appears to be a reflection of the Government Life building behind it. 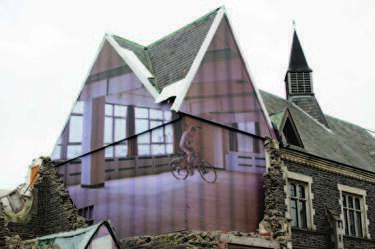 A photograph of a detail of Mike Hewson's artwork, 'Government Life Suspension', on the side of the former Chancery Arcade. 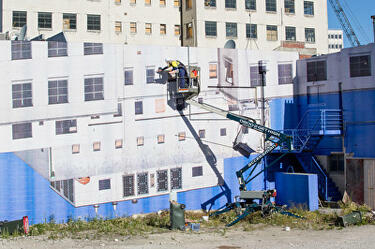 A photograph of Mike Hewson's artwork, 'Government Life Suspension', being installed on the side of the former Chancery Arcade. 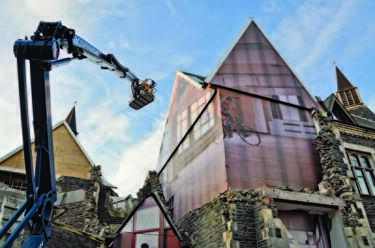 A photograph of part of Mike Hewson's installation 'Homage to the Lost Spaces' on the earthquake-damaged Cranmer Courts building. 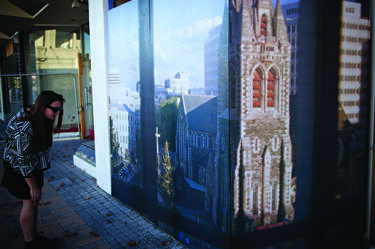 A photograph of Mike Hewson's artwork, 'Deconstruction', on the walkway between Ballantyne's and the former bus exchange building. 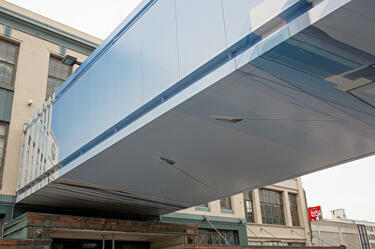 The photograph is taken from beneath the walkway, so that the distorted perspective which enables the illusion can be seen. 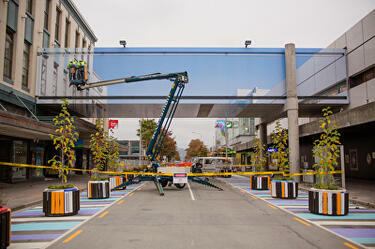 A photograph of Mike Hewson's artwork, 'Deconstruction', being installed on the walkway between Ballantyne's and the former bus exchange building.